Flowers: Tiny white flowers with pink touches, summer to fall, red fruit follows; silver-gray fuzzy leaves. 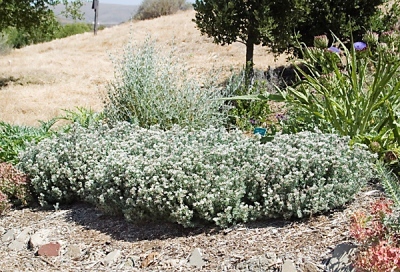 Uses: Ground cover, border, slopes, rock gardens, silver color. Fire resistive. Pruning: Shear back 2 to 3 inches occasionally after blooming. Notes: Hardy to 20° F.